This is still the definitive account about the rise of Microsoft. I really like how the author deals with the evolution of programming languages and how Gates redefined the whole idea of software. I can appreciate from this history just how hugely innovative Windows was. It provides a very favorable view of Gates and especially his technical skills. Yet, it also shows how rapid growth led to a corporate culture that in some ways stymied coordination and collaboration, embodied in the company's inability to meet release deadlines. 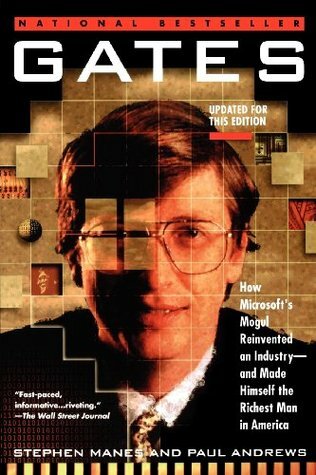 This is one of my favorite books - I loved the story of how Microsoft came to be and how Gates manipulated everyone, including the Execs at IBM. If you enjoy reading about how companies are made, and the risks that are taken, this is a MUST read. Incredibly well researched and detailed book, almost to a fault. The 460 page tome spares nary a detail or characters from the life and times of Bill Gates and Microsoft... so much so that it becomes specific names, projects and programs start "compositing" themselves into one another, difficult to keep track of individually. Still, the writing is supurb, following a tightly chronological timeline, and effortlessly tying in detail and contexts from a wide variety of primary sources. The narrative flow never gets bogged down in too much bibliographical concerns, and at times feels like a well written fiction.More than the writing, the account is a fascinating look at a fascinating life in technology. The authors clearly have respect for their subject, but honestly present Gates in all this many quircks and insecurities. Great business book profiling the very uncertain dealings and situations that seem so storybook today, without ever casting Gates in a heroic or stereotypical mold. Good quote from epilogue:"Business? Business was interesting, but it certaintly wasn't pure, and as Gates told one interviewer, 'The business side is easy - EASY!' Businessmen were interesting, but Gates had no illusions about their general level of brilliance. For him, it was no contest, the reason he could sell them on almost anything. As former IBMer Ed Iacobucci said, "Put a middle manager on one side of the table and Bill on the other, who can deal with technical issues: WHo wins that deal?"" This is an excellent detailed story of the earliest days before Microsoft existed to its preeminence. To finally see the real path inside local Seattle that led to the beginnings is a real treat. Learn here why it wasn't necessarily a good strategy to learn computer science at the University of Washington in the 1980s under the assumption that it would lead to Microsoft. The truth about the invention of DOS and also the beginnings of the BASIC which was employed in early microcomputers is well covered. I recommend this as the book to read on the subject because it dispels a lot of myths and assumptions about early Microsoft, replacing them with facts. Good background stories on how Microsoft got started. I never knew that early Ms products were not written on PC s themselves, but actually created on PC emulators on a VAX or other mainframe. This allowed them to have software ready as soon as a new machine was available for the market. And stories about Gates' fast driving habits are fun. Too bad the book ends mid-90-ties, I think an 2nd part about the more recent period (revival of Apple, philantropic work) will be as interesting. This book gives many details about what Bill Gates was like in his younger days, and how he rose to the top. The reader will get an idea of what it was like to work for Microsoft in those early days. It includes everything from Bill's temper tantrums to his hygiene habits, as well as romances with ex-girlfriends and his wife. Although this book was written about 14 years ago, I still think it is the best biography of Bill Gates on the market. Brilliantly researched and written. A fair and objective insight into one of the most influential men of the 20th and 21st centuries. Highly recommended especially for those who grew up with the birth and rise of the PC. I picked this up in a Library in Big Sur, expecting to learn about Bill Gates, and instead found it was about the history of the PC industry. A fascinating history, and still a very relevant read, even though the history stops at 1995. There have been just a few developments since then! Well researched book on early days of Microsoft. Stephen Manes Paul Andrews - Stephen Manes (born 1949) wrote the "Digital Tools" column that appeared in every issue of Forbes until recently when he took a break. He is expected to return in the future. He is also co-host and co-executive editor of the public television series "PC World's Digital Duo," a program he helped create.Manes was previously the Personal Computers columnist for the Science Times section of The New York Times and a regular columnist for InformationWeek. He has been on the technology beat since 1982 as a columnist and contributing editor for PC Magazine, PC/Computing, PC Sources, PCjr, and Netguide. The now defunct Marketing Computers named him one of the four most influential writers about the computer industry and called him "a strong critical voice. "From April 1995 to December 2008, he also wrote the "Full Disclosure" column, anchoring the back page of PC World.Manes is coauthor of the best-selling and definitive biography Gates: How Microsoft's Mogul Reinvented an Industry--and Made Himself the Richest Man in America. He also wrote The Complete MCI Mail Handbook and programmed much of the Starfixer and UnderGround WordStar software packages.Manes is also the author of more than 30 books for children and young adults, including the Publishers Weekly bestseller Make Four Million Dollars by Next Thursday! and the award-winning Be a Perfect Person in Just Three Days!, which was adapted for the public television series Wonderworks. His books include the cult favorites Chicken Trek and The Obnoxious Jerks and have won a commendation from the National Science Foundation, International Reading Association Children's Choice awards, and kid-voted awards in five states. His writing credits also include television programs produced by ABC Television and KCET/Los Angeles and the 70s classic 20th Century-Fox movie Mother, Jugs & Speed.Manes is currently serving his fourth term as an elected member of the National Council of the Authors Guild, the country's oldest organization of book authors. Born and raised in the hills of Pittsburgh, he now lives in hillier Seattle.